At Union Square Ventures, we spend a lot of time thinking about networks. Financial networks, social networks, data networks, and yes, even decentralized networks. But the most “meta” version of this is the network we’ve spent the past seven years cultivating among the employees of our active portfolio companies -- our USV portfolio network. The USV network enables cross-pollination of ideas among our portfolio companies by fostering connections between people thinking about similar business challenges or problems. We invite every employee (regardless of seniority) from each of our portfolio companies into the network. Due to this access, with every added node (i.e. company), our portfolio members become collectively smarter and better equipped to make the best decisions possible in their day-to-day. In this way, we hope to break down silos across companies and democratize access to knowledge about best practices in building businesses. Because knowledge and experience are powerful and intangible resources, access to the network as a resource allows each of our businesses to become incrementally more successful. If you work for a USV portfolio company, there is no additional hurdle or secret password: You’re in the network. While you may be working at a small startup, you have access to the knowledge and experience of a large corporation. Right now, we estimate that the total size of our network is approximately 8,000 employees across our 70 active investments. If you add in our extended “alumni” community, comprised of former employees or current employees at exited portfolio companies (such as MongoDB, Twitter, Etsy, Twilio, and Lending Club) the reach of this network jumps to 20,000+. That’s on par with the total number of employees at Facebook and equal to the number of Boston Consulting Group alumni. Needless to say, when you’re part of a group of people that’s 8,000 strong, it suddenly doesn’t seem so scary to take a job as the only finance leader at a 25-person company. 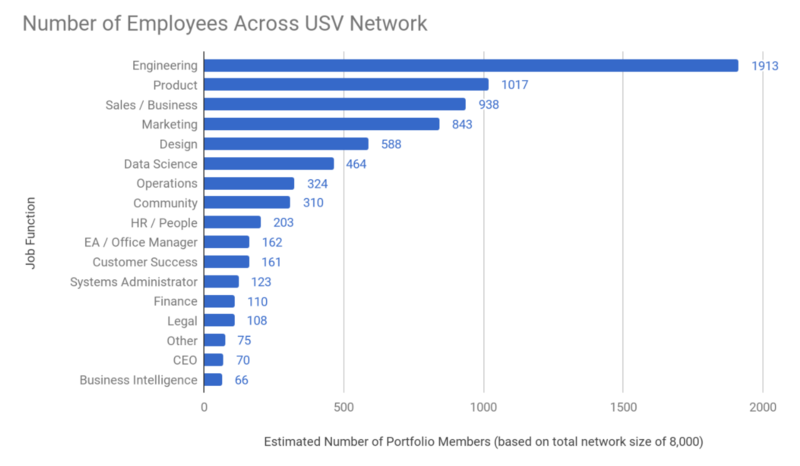 To access these network connections, employees at USV companies are invited to join more than 100 portfolio-only events each year. Each “summit” event is organized as an “unconference” format: crowd-sourced ideas, open questions and discussion groups based on different topics or challenges creates the framework for the sessions. 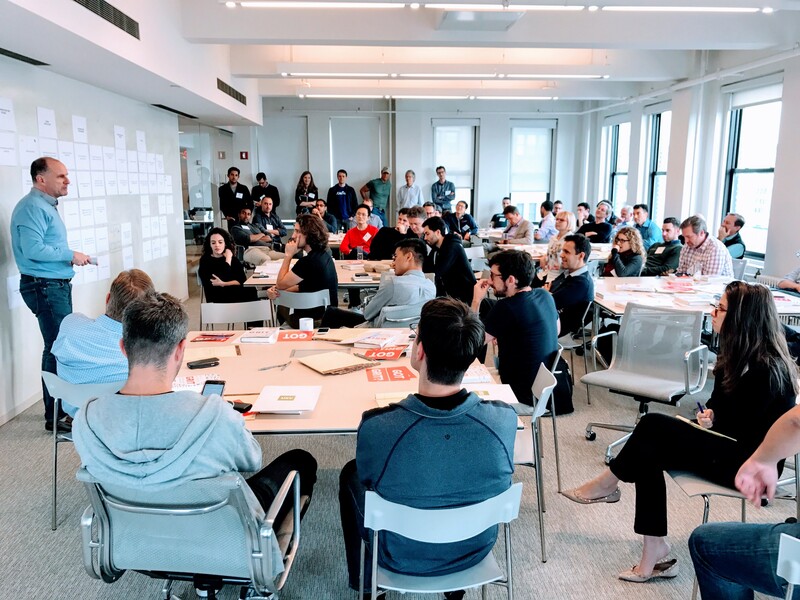 A selection of events this year includes day-long summits on scaling, internationalization, engineering leadership strategies, and integrating product management into organizations. We also offered recurring roundtable discussions among curated groups for finance, legal, or human resource professionals, as well as opportunities for discussion on broader topics such as diversity, inclusion, and women in leadership. Event themes are surfaced by employees in the portfolio network, and all programming is specially curated for the entire portfolio. In this way, we surface relevant and timely topics that can have direct impact across multiple growing businesses at once. The businesses we invest in each grow stronger when more data is contributed to their platforms. Similarly, with each new investment we make, the experience of working for a USV portfolio companies gets a little bit better. These are the network effects among our portfolio. We hope one day you’ll be a part of this network too. And if you happen to be on the job hunt now, we encourage you to check out the 2,000+ job openings across 58 portfolio companies currently hiring. If you would like to share your ideas, business, or feedback with us, please send us email at [email protected]. All business plan submissions must include a clear description of your operations and current progress.